[H]ard|OCP have once again voided a warranty in the goal of better overclocking. The past several generations of Intel chips have sparked debate on the effectiveness of their thermal solutions, prompting numerous users to delid their processor to replace the thermal compound inside to improve cooling performance. 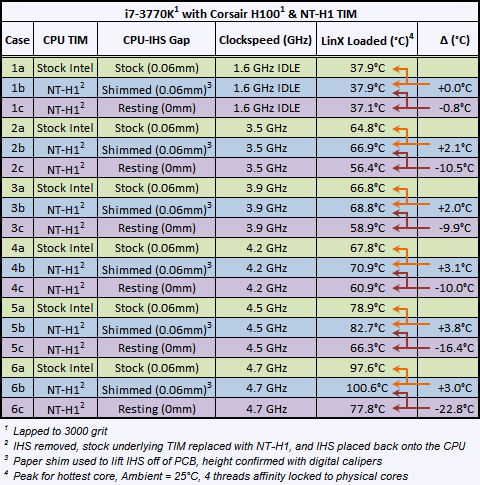 With the results of the tests it is clear that the TIM in Coffee Lake is limiting the processor, temperatures decreased by 10C or more at stock and [H] could reach higher stable overclocks once they replaced the TIM that Intel used. Delidding is not for the faint of heart however, many a CPU has met its death during the process so do be aware of that. Let us hope this trend does not continue for much longer. "We've gotten to spend some quality time with our Intel Core i5-8600K Coffee Lake CPU, and of course we have spent our time finding out just how far we could push the processor's clock under both Air Cooling and Water Cooling. We relid and delid as well. The results look to be very promising for the overclocking enthusiast and gamer." Feel free to inform us. And take into account that they still solder their most expensive products. You really need someone to inform you in this day and age when Google is but a click away? There are many reasons behind Intel switching from a Pb based TIM to a silicon based TIM and considering they spent a lot of money on R&D to do so costs don't factor into it. And no Intel don't use a Pb based solder TIM for all their high end CPUs, that's unless you consider socket R4 Xeon's not to be high end. The issue is that your intial comment was meant to be a "flame" and start an argument, and now that someone has basically returned the favor to you, then you decide to feel hurt? As a consumer, I don't care at all about the details or the reseasons, all I care about are the results. Who cares what Intel's reasons are, who cares what the theories are, what matters is that Intel used an-almost-sub-par solution and it shows. Did they do it to cut corners? I don't care. did they do it becuase of tech reasons? I still don't care. All I care about is that they could have made these chips better, but they did not and still charge more money. And do you know better than to moderate flames with gasoline? That's what the delete button is for. The low quality/taunting one specifically. Fear not. It's not "taunting" in any way. That's just a placebo effect for who needs it. That's the spirit, I like the ones that make me laugh. Looks like I came to the right place then. Cheers. Not at all, my initial comment was not meant to be a "flame" and my subsequent one was not intended to convey "hurt", I'm just fed up with people who know very little about materials science making comments about how Intel (or any other company for that matter) is nickel-and-diming their customers by using a silicon based TIM. As for only caring about the results that's plainly not true, otherwise you wouldn't be calling their solution almost-sub-par. They sell CPU whatever at whatever specification and people are getting what's on written on the box. Could Intel go back to a Pb based indium solder, yes but then they'd lose their "green" credentials that they've invested a lot of money into, same goes from using halogen free substrate material. Could Intel work to tighter tolerances when fitting the IHS to reduced the thermal interface gap, yes but that would result in a higher failure rate both during manufacturing and when customers install heatsinks. Could Intel use a "better" quality silicon based TIM, not really as their already using one of the best (Dow Corning TC-5022 and Honeywell PCM45F) thermally efficient silicon based TIM's with a decent lifetime on the market. Also, maybe with such confined high temps intel CPUs get nowadays, any soldering would probably melt overtime - or "crack", as they said. If i recall correctly, wasnt their conclusion that the stock TIM was decent, but the real temperature improvement came from getting a thinner layer of TIM needed by seating the IHS better and thus getting it physically closer to the core? I havent read this article yet, but i did read the previous ones for the 7000 series Kaby Lake parts. That was the same conclusion since Ivy Bridge (images dead due to Photobucket, key graph rehosted here) and the original switch to internal TIM. But the "cheap TIM" meme survives, because people prefer a good 'big Intel are cheap!' story over accuracy. The gap between die and IHS is strain relief, so prevent the IHS contacting the corner of the die (and cracking it) when unevenly loaded. Exactly why the neither the word cheap nor any of its synonyms appear in my post. I personally think they could implement a better solution that retains some strain relief without compromising heat transfer as much; delidding is damn dangerous. Then again the vast majority of Coffee Lake owners will never notice slight thermal throttling, let alone try to overclock so it doesn't make much sense financially.